Cloudy. Low 46F. Winds NW at 5 to 10 mph..
Investigators with the King County Sheriff's Office walk into the former home of James McClintock in South Bend, Wash., Wednesday. McClintock's former caregiver and her husband have been charged in the murders of three others. SOUTH BEND, Wash.— Michelle and David Knotek, accused in the deaths of three people who lived at their rural Raymond home, were charged Wednesday with first-degree murder. Michelle Knotek, 49, was charged with two counts of first-degree murder in the deaths of Kathy Loreno, a 36-year-old hairdresser who was reported missing in 1994, and Ronald Woodworth, a 57-year-old man who disappeared last month. David Knotek, 51, was charged with one count of first-degree murder in the shooting death of Shane Watson, the couple's 19-year-old nephew. He disappeared some time after Loreno was last seen. The charges filed by Pacific County Deputy Prosecutor Lori Miller allege that Michelle Knotek showed "extreme indifference to human life" and abused Loreno and Woodworth to death. Both Knoteks face a possible sentence of life in prison. David Knotek was also charged with rendering criminal assistance and unlawful disposal of human remains in Woodworth's death. Remains recovered from the couple's backyard are likely Woodworth's, authorities said. Affidavits filed earlier this week in Pacific County Superior Court describe witness accounts of torture, abuse and death at the Knoteks' quaint red farmhouse on a quiet country road. David and Michelle Knotek were being held at the Pacific County Jail in South Bend. Bail was set at $2 million each. They were scheduled for an arraignment hearing on Thursday. 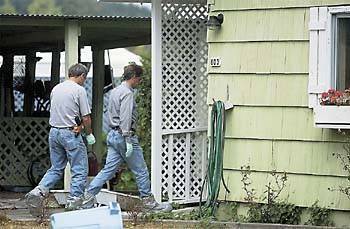 The King County Medical Examiner performed an autopsy Wednesday on the body exhumed from the Knoteks' yard. Pacific County Prosecutor David Burke, who doubles as the county coroner, would not comment on the results. "The process is ongoing," Burke said. "It's a lot more complicated than people think." According to the affidavits, David Knotek confessed to sheriff's deputies that he shot Watson and burned his body. Witnesses told deputies that Michelle Knotek was enraged when she discovered that Watson had photographed Loreno's injuries, and the young man disappeared soon after Loreno died. David Knotek told deputies that he also burned Loreno's body after she died, and buried Woodworth's body after his wife told him that Woodworth had committed suicide. Witnesses said Michelle Knotek abused and tortured Loreno and Woodworth. In court papers, they described seeing her force Woodworth to do chores outside, wearing only his underwear, and jump off things onto gravel in his bare feet. The witnesses also told deputies Michelle Knotek burned Woodworth's injured feet with boiling hot water. David Knotek, a construction worker, told a sheriff's deputy last Friday where Woodworth's body was buried, the affidavits said. The search for evidence continued Wednesday at the Knoteks' house on Monohon Landing Road. Dozens of law enforcement officials sifted through buckets of dirt in the backyard and poked through the weedy field next to the house. Sheriff John Didion said they were looking for any traces of evidence. On a fence post near the house, someone left a yellow flower with a note: "In loving memory of Shane, from your friends and family." Diana Watson is Michelle Knotek's stepmother and Shane Watson's grandmother. She told The Daily World of Aberdeen that her stepdaughter was prone to wild lies and angry outbursts. "She told everyone in the family that she had cancer, and David went right along with it," the 59-year-old stepmother said. "It didn't matter what Shelly would lie about. He'd stick up for her." Diana Watson said Shane Watson had a troubled, unstable family life before he moved in with the Knoteks. The family "thought it would be better for him to be in a family environment," she said. She's trying to track down his father before holding a memorial service for the young man. Though she said she loves her stepdaughter, Diana Watson told The Daily World that she wishes both Knoteks would get the death penalty. "In my opinion, they both bought a one-way ticket to hell," she said. Just down the road in South Bend, police officers and sheriff's deputies began a second investigation at the former home of James McClintock, 81, who died at the home in February 2002. Michelle Knotek, who had been acting as his caregiver, told medics he had fallen. His death certificate said he died of a blunt impact to the head, but the cause of that impact was undetermined. The old man fell frequently, South Bend Police Chief Dave Eastham said, so no one thought it was suspicious at the time. McClintock, a retired merchant crewman, left his estate, including a home valued at $140,000, to his beloved black lab "Sissy," with instructions that the remainder of the estate go to Michelle Knotek when the dog died. Now police are wondering whether McClintock's death was really an accident. But Eastham told The Seattle Times that McClintock lived long enough to speak to deputies about his fall. "If he was victimized, I doubt he would have kept it to himself," the police chief said. Michelle Knotek took Sissy after the old man's death and, five months later, reported that Sissy had died, which meant the South Bend house was hers. In yet another twist, an older female black lab, with no identification, was among six dogs taken from the Knotek home by sheriff's officers. "We have a dog here that may be Sissy," said Dr. Gina Lewis of Vetters Animal Hospital in Raymond. Lewis treated Sissy for years.